Please note that the content of this book primarily consists of articles available from Wikipedia or other free sources online. A nuclear submarine is a submarine powered by a nuclear reactor. The performance advantages of nuclear submarines over "conventional" diesel-electric submarines are considerable: nuclear propulsion, being completely independent of air, frees the submarine from the need to surface frequently, as is necessary for conventional submarines; the large amount of power generated by a nuclear reactor allows nuclear submarines to operate at high speed for long durations; and the long interval between refuellings grants a range limited only by consumables such as food. Current generations of nuclear submarines never need to be refueled throughout their 25-year lifespans. 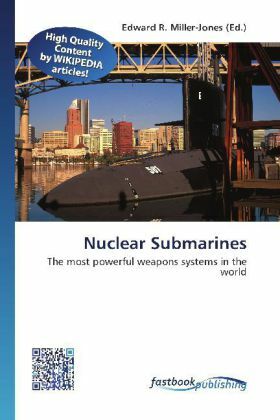 Learn more about nuclear submarines, their abilities and significance in the following pages.